I stumbled across a screenshot of Creamy Mami one day, and thought Mami looked like such a silly character that I needed to know who the heck she was. After googling various images of her, I felt the urge to watch an episode or two. I finished the whole anime in about two weeks. That's huge for me. The characters were so unique and lively, sticking to the same personality throughout the series. It was especially exciting to see Morisawa Yuu, the main character, display such childlike and immature qualities, as it seems as though people often depict their characters as "pure," or "perfect," and what not. In this way, the characters were very relatable and fun to watch! My only complaint about the characters they introduced in the series would be that many of the episodes brought forth interesting people - accompanied with complex backstories - that were never to appear again. Even so, the abundance of unique, cute stories that elapsed over the Creamy Mami anime kept me from getting uninterested ^u^ Oftentimes, when animes follow a type of overly-serious plot, the emotional parts seem much less touching. In contrast, when the sweet, romantic scenes appeared in Creamy Mami, it just felt like the cutest thing! In general, I probably took to this anime so fast because it's part of my favorite genre: comedy. I love sad animes, but ones that are based on such emotions are often not as funny to me, and I like to experience all sorts of feelings when I get into a story. That was definitely present as I watched Creamy Mami. I rated Creamy Mami nine stars. This might be seen as over-generous, as the story didn't really develop/change, and much of the magical aspects were never fully explained or advanced. To put it simply, a lot of the interesting ideas felt as though they were never finished, and that was a little disheartening. Even so, I was tempted to give Creamy Mami a 10/10 for reminding me of the importance of innocence and of a simple, straight-forward love story. After reading the Moe Manifesto (A book that covers the history of moe, full of interviews from creators of moe work), I really wanted to look into some of the early 80s series mentioned. There were two series that caught my eye, Creamy Mami and Minky Momo. I could not find subs for the latter, so I decided to watch Mami since all of its episodes were subbed. I did not know what I would be getting myself into. Somehow, I was pretty hooked. 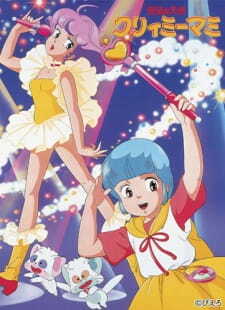 Creamy Mami is one of the most unique magical girl series I have seen. What stands out with this anime is how Yuu’s transforming idol career is integrated to its episodic story structure. In each episode, Creamy Mami covers a lot of intriguing themes and subjects that I did not expect. The situations Yuu goes through with her career can range from bizarre to surprisingly mature, covering the struggles of an idol in the most effective, kid-friendly way possible. Its cast of characters also shine. Yuu started out pretty generic, but she became likable as more episodes showcased her child-like personality. The rest of the cast are rather cheesy, but very likable on their own right. Shingo/Megumi’s messy relationship and Toshio’s silly disdain for Yuu works for pretty solid comedy. If there were any problems, they are minor. Sometimes, a song gets repeated too many times in many to the point where it can get irritating. I wish there were more variety in the music choices. And this is mostly preferential, but I wish Yuu’s story as Mami were progressive. Its episodic format works fine, but I would have loved to see some form of character development that could make satisfying growth for Yuu. Overall, I really enjoyed my spare time with Creamy Mami. There is just enough variety and enjoyment in Mami’s stories and characters for me to keep watching all the way through. If you liked the episodic nature of older magical girl anime like Cardcaptor Sakura, you will definitely love Creamy Mami. I will now take my leave as I listen to Mami's song "Fall in Love" for the umpteenth time. 16 Anime Inspired Makeup Products! Who says anime fans can't have other hobbies? For the fangirls and fanboys of the world that also like to do some magical girl transformations of their own, here's a bunch of makeup products inspired by your favorite characters!